For week two of the One Room Challenge™, I wanted to share with you my inspiration for the loft playroom that I am designing. To me, one of the most enjoyable parts of interior design is finding your inspiration. Sometimes inspiration can come from a vacation, or place you have fond memories of. Sometimes it can be somewhere that you imagine going. I like to use these experiences to create rooms with a sense of history. I wanted this playroom to feel like a retro, lakeside sleep-away camp. The first thing that came to my mind when I pictured a good old fashioned sleep away camp is a traditional Pendleton blanket. You can’t go wrong with one of these classic staples. 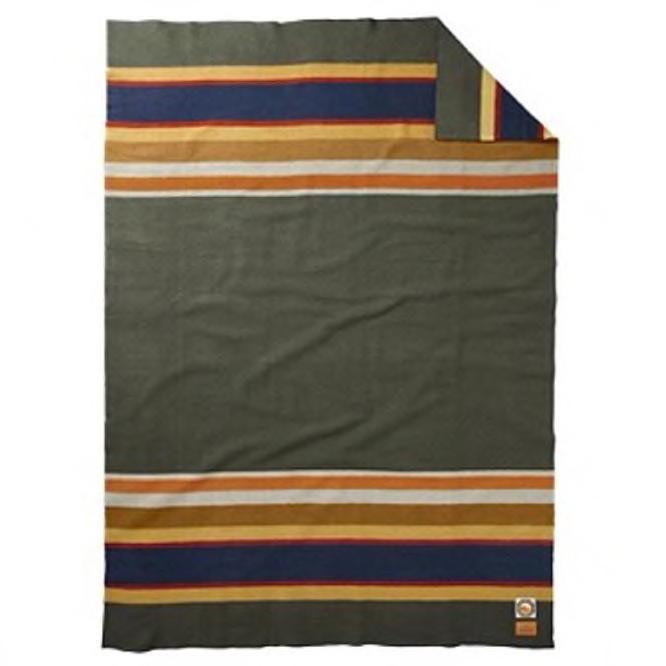 I found the ideal Pendleton blanket to be my jumping off point for this room at Overstock.com. Isn’t it perfect? The colors were just right for a more masculine boy space and it worked well with the sofa I needed to use. I love every detail of this blanket from the color and texture right down to the touch of leather used in the tag. All of these details will be reflected in my room design. After finding the blanket, it was easy to source the throw pillows for the sofa and window seats. I knew practical storage was one of my main goals and I had these green, rolling, canvas bins that fit perfectly under our built-in shelves. I loved the idea of bringing in a little more of the green, and leather, and the canvas reminds me of a tent. I wanted to replace the boring white cubbies under the TV for something a little more industrial looking and found the perfect storage solution with the metal cubby drawers. A few fun retro accessories round out the room including a vintage chalkboard, vintage trophies, and antique globes. One of my favorite things in this room are the motivational pennants. Not only do they look great and fit the feel of the room, but I also love the idea that my little man will be surrounded by these words of inspiration every day. Be sure to check back next week. I’m going to share some playroom storage solutions that are both beautiful and functional. 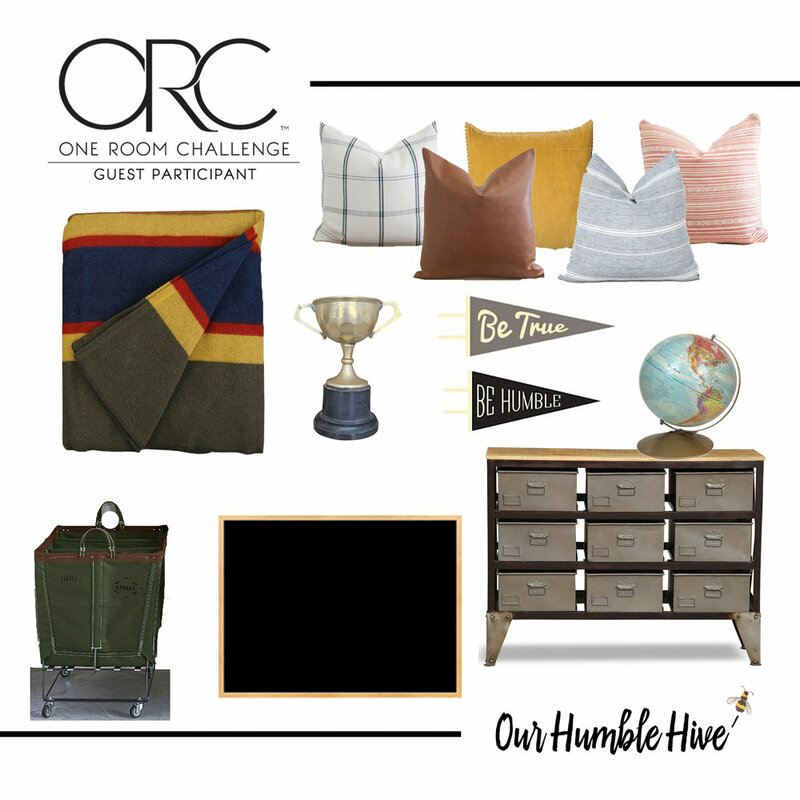 You can follow along with the other participants in the One Room Challenge™ by clicking the link below.